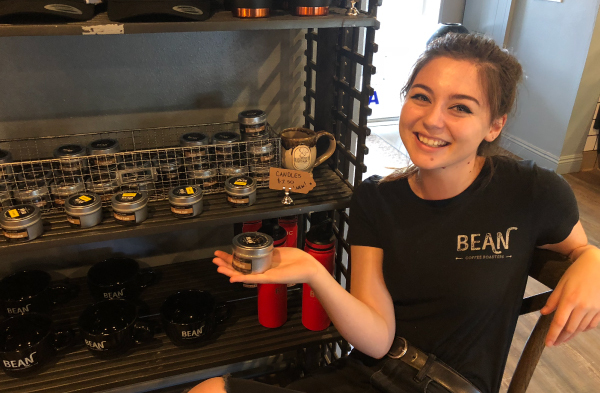 Have You Heard About Bean Coffee Roasters Candles? I’m amazed at what Rachel has put together. She shared with me some of the things that are unique to her candles beyond the proprietary Bean Coffee Roasters flavor/scent. She used a soy-based wax because it burns cleaner and is a more natural, sustainable alternative to traditional waxes (and some people are allergic to paraffin wax), cotton wicks that burn cleaner and contain no lead or zinc, and she raised the melting point temperature (through some form of magic I guess) so the candles don’t start melting until they are supposed to. Rachel has more options and formats under development in her workshop that she will be revealing soon so watch for more information. I know people will be wanting to have some of these candles around for the Thanksgiving and Christmas holiday seasons. If you’re looking for gift ideas that are truly unique and guaranteed to bring joy to the recipients, buy them an assortment of Bean Coffee Roasters scented candles and a gift card for a couple free drinks. Rachel is hoping to have special gift baskets containing the candles available for us very soon. Great job, Rachel! And thank you from your Bean family! New Location to Get Your Bean Coffee Roasters Coffee Now Open! Who’s Who at Bean Coffee Roasters? Bean Coffee Roasters epitomizes the direction of the coffee industry in the early 21st century. Always advocates for conservation, Bean Coffee Roasters strives to minimize waste, roasting small, individual batches of coffee, never serving any beans roasted over 36 hours ago.